What Are Your Family's Top 5 Moral Values? 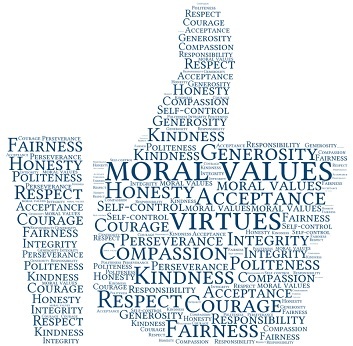 What are your deepest held moral values? How are you teaching these values to your children? Are you doing it alone or are you seeking help from religious organizations or other resources? Teaching your kids moral values is one of the most important responsibilities you have as a parent. In order for your children to act morally, they need to know the good, care about the good and practice doing the good. The way your kids choose to treat others is critical. There are too many news stories of children committing suicide due in part to the cruel behavior of other kids. There are too many kids posting mean comments on social media. Too many kids avoiding activities due to bullying. How do you guide your kids in treating others? There is a big difference between knowing about moral values and actually trying to adopt the traits. Often standing up for your morals takes courage and strength. After your family has selected your top five values, find examples of how you’ve demonstrated those in the past. Your kids may want to create a poster for each value with pictures and examples of that value. Leave space to add more examples. Next encourage each person commit to one value they want to focus on for the week. Check in daily with each other to see if there was an opportunity to act on that value. What happened? How did it feel? What did you learn? Asking your kids these questions sends the message that you care about these values. Like adults, your kids will make mistakes and act in ways that don’t represent their highest values. When this happens, help them find a way to make amends. Ask questions to guide your kids in figuring out what they would like to do to make things better. Your kids will have daily opportunities to choose to act on their values. Behaving ethically requires a strong moral conviction. It’s a proud moment when your children choose to show compassion and take responsibility for speaking up. During a middle school basketball game in Kenosha, Wisconsin, the kids demonstrated their moral convictions. CBS reported “The student athletes stood up for one of the team's cheerleaders when they heard some derogatory words directed toward her during a basketball game at Lincoln Middle School. Chase Vazquez, Scooter Terrien and Miles Rodriguez walked off the court in the middle of the game to address the mean-spirited comments directed at cheerleader Desiree Andrews, who has Down syndrome.” Wow! Neurodiverse students like Desiree offer opportunities to demonstrate your values. You can help your kids build empathy and compassion for neurodiverse kids by watching some of the videos Chris Ulmer, a special education teacher and founder of Special Books by Special Kids has created. This simple acronym helps kids pause to consider the impact of their words and actions beforehand. While your children will have many influences on their moral development, you play the biggest role. You are their first teacher. They look to you to learn how to act in the world. While your words are important, it will be your actions that will teach them the most. How are your actions guiding your children in living up to your highest values? Parenting expert Kathy Slattengren, M. Ed., is dedicated to supporting parents in doing their best parenting. She helps families create homes where everyone feels accepted, heard, respected and appreciated. Do you want to print out this article? A PDF version is available for printing.